Indak-indak sa Kadalanan (Street Dancing), one of the most awaited highlights of the week long Kadayawan Festival in Davao City, pushes through as scheduled this August 17, 2013, from 8 a.m. to 5 p.m.
Indak-indak, a mardi gras-like event, is a street dance competition participated in by representatives from different schools, communities, and organization in their colorful tribal costumes and props. It's a competition of choreographed and theatrical dance in the tribal beat of drums and/ or other musical instruments performed in the major streets of Davao City. 2. showdown performance - participants will perform in an on-the-round manner with a minimum of 5 minutes and maximum of 8 minutes. There are two categories in this competition. One is the open category (or that with “out-of-town” contingents); and the other is Davao City-based category. Participants in this competition must be at least 7 years old. The minimum number of participants is 30 and maximum is 100 dancers. The minimum number of musicians is 20 and maximum of 50. 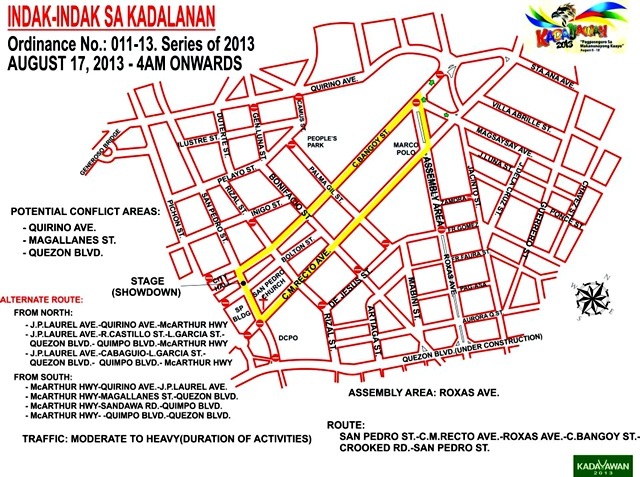 The 24 contingents in this year's competition will perform their respective street dances starting from San Pedro St., to C.M Recto Avenue, left to Roxas Avenue, then left to C. Bangoy St., to Crooked Road, to San Pedro St. The showdown performance will be held at the Rizal Park along San Pedro St.